Defective plastic parts are often only found late in the day and after significant investment of time and money. By attending this one-day course you will gain an understanding of the causes of part defects and how to avoid them. Common plastic part defects will be explored and solutions developed, enabling attendees to design plastic parts with confidence. 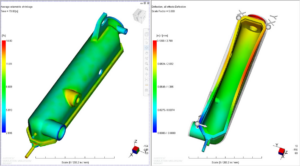 This course will also introduce the application of Finite Element Analysis (FEA) tools to identify issues early in the design cycle. This course is aimed at all designers and engineers involved with injection moulded parts. Toolmakers and technicians looking to increase their understanding of the injection moulding process will also benefit from attending this course.